Citation: Looser PM, Lin F, Wong SC (2018) Bioresorbable Vascular Scaffold in a Patient with Metal Allergies and the Autoimmune/Autoinflammatory Syndrome Induced by Adjuvants. Int J Case Rep 2:1. Copyright: © 2018 Looser PM, et al. This is an open-access article distributed under the terms of the Creative Commons Attribution License, which permits unrestricted use, distribution, and reproduction in any medium, provided the original author and source are credited. Introduction: We present a case of a patient with a history of severe allergies to components of metal-based stent platforms and refractory angina due to a critically obstructive lesion in the mid right coronary artery. Background: Patients with metal allergies to components of metallic stent alloys have limited options in regards to percutaneous coronary intervention. Bioresorbable vascular scaffolds (BVS) may have a role in revascularization in this subset of patients. Methods/Results: Single case report from a tertiary care center of a 76-year-old female with multiple metal allergies and autoimmune inflammatory syndrome induced by adjuvants (ASIA syndrome) undergoing percutaneous coronary intervention for unstable angina via the femoral approach. 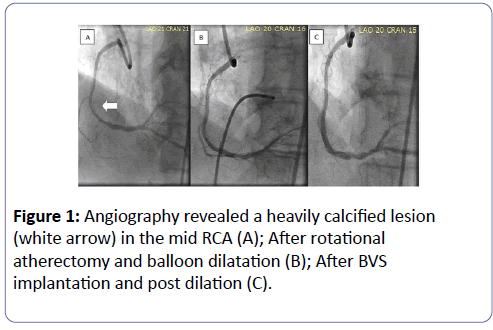 The calcified RCA lesion was successfully debulked with rotational atherectomy followed by intravascular ultrasound/optical coherence tomography guided BVS implantation with excellent stent expansion and apposition. The patient had an uneventful post procedure course and her symptoms improved dramatically 60 days post procedure. Conclusions: To our knowledge, this is the first report of BVS implantation in a patient with multiple metal allergies and ASIA syndrome. BVS provides a more optimal, safer percutaneous revascularization strategy in patients with these rare conditions. The patient is a 76-year-old female physician who presented with three months history of worsening exertional dyspnea to walking one block with occasional dyspnea at rest. In addition, she complained of intermittent effort related “shocking discomfort” over the neck and shoulders which radiated to the left side of her chest. Her past medical history includes hyperlipidemia, hypertension, rheumatoid arthritis, breast cancer in-situ treated with lumpectomy and raloxifine, Hashimoto’s thyroiditis, and the autoimmune inflammatory syndrome induced by adjuvants (ASIA, or Schoenfeld’s syndrome). Patient has history of multiple allergies included latex and colchicine which caused a rash as well as diflunisal which caused anaphylaxis. In addition, prior skin tests confirmed allergies to a litany of metals including silver, titanium, bismuth, cobalt, and nickel. Initial work up by her primary cardiologist for her progressive effort related dyspnea and chest discomfort included an unremarkable ECG and an echocardiogram revealed mild diastolic dysfunction, mild mitral regurgitation with preserved left ventricular ejection fraction. A calcium score of 1,414 was noted on cardiac computed tomography. As a result, she was referred to an outside institution for right and left heart catheterization, which revealed mild pulmonary hypertension (mean pulmonary artery pressure=29 mmHg) with a pulmonary capillary wedge pressure of 17 mmHg and an obstructive, heavily calcified 90% lesion in the mid right coronary artery (Figure 1A). Medications at that time included methotrexate, hydroxychloroquine, nebivolol, losartan, atorvastatin, esomeprazole, meloxicam, levothyroxine, prednisone, furosemide, and ospemifene. She took topical corticosteroids, diphenhydramine and alprazolam as needed. She was intolerant of additional anti-anginals: calcium channel blockers caused symptomatic hypotension, and long-acting nitrates caused headaches. Figure 1: Angiography revealed a heavily calcified lesion (white arrow) in the mid RCA (A); After rotational atherectomy and balloon dilatation (B); After BVS implantation and post dilation (C). She was initially evaluated by a cardiothoracic surgeon who in turn referred her to an interventional cardiologist (SCW). Following her office visit, bioresorbable vascular scaffold (BVS) implantation seemed to be the most reasonable treatment strategy for the patient. Since the radiopaque markers in commercially available BVS are made of platinum, she was referred to an allergist who performed platinum allergy testing, which was negative. The patient underwent percutaneous coronary intervention (PCI) via the right femoral approach using a 7F Amplatzer Left 0.75 guiding catheter (Medtronic, Santa Rosa, CA). The heavily calcified lesion was modified with rotational atherectomy (RA) using a 1.5 mm burr (Boston Scientific, Natick, MA). Once the lesion was debulked, optimal predilation was achieved using multiple inflations with non-compliant balloons: 3.0 × 15 mm balloon at 20 atms for 20 s and a 3.25 × 15 mm balloon at 18 atms for 20 s (Quantum NC, Boston Scientific, Natick, MA) (Figure 1B). Intravascular ultrasound (IVUS) (Volcano, San Diego, CA) was used to confirm optimal lesion predilation and for lesion length/BVS sizing. Two overlapping 3.0 x 18 mm Absorb GT1 BVS (Abbott Vascular, Temacula, CA) were implanted, both deployed at 8 atm of pressure for 60 s. The scaffolds were post dilated with two 3.5 x 15 mm non-compliant balloons (NC Trek, Abbott Vascular, Santa Clara, CA and Empira NC, Cordis, Johnson & Johnson, Miami, FL) at 19 atms for 60 s. A second post-dilatation with Empira NC (Cordis, Johnson & Johnson, Miami, FL) at 18 atm for 20 s was necessary due to scaffold under-expansion (Figure 1C). However, we were unable to confirm full embedment of the struts into the vessel wall due to inadequate scaffold/ endoluminal surface interface imaging (Figure 2A). We proceeded to use optical coherence tomography (St. Jude St Paul, MN) which revealed excellent scaffold expansion, and full embedment of the scaffold struts without evidence of edge dissection (Figure 2B). Her post procedural course was uncomplicated and the patient was discharged the following day without incident. Two months post procedure, her dyspnea and atypical chest pain had improved remarkably. Her exercise tolerance also increased from a baseline of one block to several blocks two months and she is actively participating in cardiac rehabilitation. 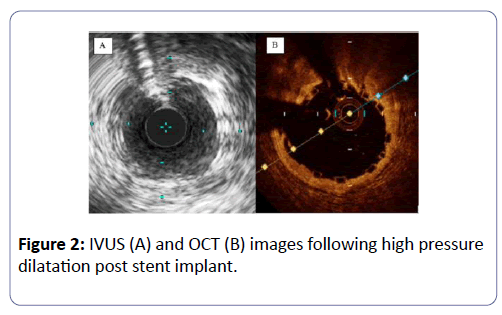 Figure 2: IVUS (A) and OCT (B) images following high pressure dilatation post stent implant. To our knowledge, this is the first case report of BVS implantation in a patient with multiple metal allergies and ASIA. Although the polymers on current metal-based DES platforms provide a barrier between metal and patient’s blood/arterial wall, the potential for polymer disruption with subsequent metal exposure on stent deployment has been demonstrated in a number of DES platforms . While the risk of a polymer coating defect is small, for patients with severe allergies to the metal components of coronary stents, the specter of allergen exposure following polymer covered metal-stent placement and its potential serious adverse clinical consequence should certainly be avoided if at all possible. The use of BVS, provided there is no platinum allergy, with optimal implantation technique would certainly provide a safer approach in the treatment of symptomatic coronary artery disease amenable to PCI in this cohort of patients. Compounding this patient’s presentation was the presence of the autoimmune inflammatory syndrome induced by adjuvants (ASIA syndrome or Shoenfeld’s syndrome). This is a complex immunologic disorder which manifests with a multitude of symptoms, including but not limited to myalgias/myositis, arthralgias, chronic fatigue/sleep disturbances, and cognitive impairment, usually associated with prior exposure to various adjuvant agents, including heavy metals (silicon and aluminum) and certain vaccines . The patient initially presented to her rheumatologist with a constellation of unexplained symptoms including focal left hip pain, generalized arthralgias/myalgias, pruritus and fatigue. Extended work up was negative, until the offending agent was determined to be a metal hip implant. After revising the prosthesis and initiating medical therapy (including methotrexate and pregabalin), her symptoms improved dramatically. For patients diagnosed with ASIA, they may have unpredictable reactions to adjuvants. Although not in the original description of ASIA syndrome, there is a case report of a patient who met ASIA criteria after surgical implantation of a nickel-titanium chin prosthesis; the patient’s symptoms abated with resection of the prosthesis and medical therapy . In our patient’s case, she had a very similar presentation with her hip prosthesis. In addition, she had both a documented allergic reaction to a number of elements present in the current metal-based stent. Thus, avoidance of traditional metal stent platforms in favor of the bioresorbable scaffolds is a logical, prudent treatment approach in this patient. In addition, this patient had a highly calcified lesion, which were largely excluded from the ABSORB trials, due to the presumption of inadequate expansion with balloon predilation, although cutting balloons and rotational atherectomy could be used at the operators’ discretion for mild to moderately calcified lesions . Data from ABSORB Japan demonstrate that moderately or heavily calcified lesions not requiring atherectomy portend the same angiographic outcomes post procedure and at 13 months compared to non-calcified lesions . RA followed by successful BVS implantation has been reported previously for both native coronary lesions  and in-stent re-stenosis  and was also successful here. In summary, we present a case of a patient with multiple metal allergies and the ASIA syndrome who underwent successful revascularization with RA and BVS implantation with substantial improvement in her dyspnea and atypical chest pain two months post procedure. This strategy may be a viable revascularization option in this patient population. Yazdani SK, Sheehy A, Pacetti S, Rittlemeyer B, Kolodgie FD, et al. (2016) Stent coating integrity of durable and biodegradable coated drug eluting stents. J Interv Cardiol 29: 483-490. Shoenfeld Y, Agmon-Levin N (2011) 'ASIA' - autoimmune/inflammatory syndrome induced by adjuvants. J Autoimmun 36: 4-8. Loyo E, Jara LJ, López PD, Puig AC (2013) Autoimmunity in connection with a metal implant: a case of autoimmune/autoinflammatory syndrome induced by adjuvants. Auto Immun Highlights 4: 33-38. Ellis SG, Kereiakes DJ, Metzger DC, Caputo RP, Rizik DG, et al. (2015) Everolimus-eluting bioresorbable scaffolds for coronary artery disease. N Engl J Med 373:1905-1915. Ohya M, Kadota K, Sotomi Y, Kozuma K, Tanabe K, et al. (2017) Impact of lesion calcification on angiographic outcomes after Absorb everolimus-eluting bioresorbable vascular scaffold implantation: an observation from the ABSORB Japan trial. EuroIntervention 12: 1738-1746. 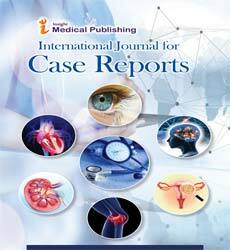 Basavarajaiah S, Naganuma T, Latib A, Colombo A (2014) Can bioabsorbable scaffolds be used in calcified lesions? Catheter Cardiovasc Interv 84: 48-52. Pereira-da-Silva T, Patrício L, Cruz Ferreira R (2015) Rotational atherectomy combined with bioresorbable vascular scaffold implantation: a feasible approach for recurrent in-stent restenosis when other therapies failed. J Invasive Cardiol 27: E143-E145.